Allright, it's a fruit cake. Hold on before you run away! This one is far away from the mass produced and displayed ones you see on grocery store shelves or given to you by your dear Auntie and that you try to pass on to your not-so-dear neighbor. This one is good, light and airy, buttery, soft and studded with only a reasonable amount of candied fruits. 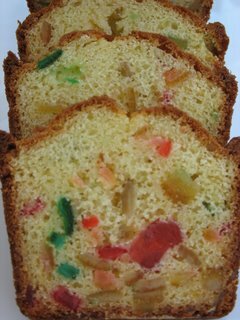 They always made me think of little gems and I have loved them since I had whole candied fruits and traditional Provencal Epiphany cake where I grew up in Provence. When I moved to the US, I brought along with me a little black notebook filled with recipes that both my mother and grandmother would make on a regular basis as well as some of my favorite cake recipes, including this one. I forgot about it for a while because I quickly discovered pumpkin, sweet potatoes and pecan pies, cornbread and biscuits. As the holidays approached I grew a little homesick and I became really excited when I found fruit cake at the grocery store. I bought one, and decided to have a couple of slices with my afternoon tea. I got anxious upon cutting it, kinda dense.... when I put the slices on my plate it was a big disappointment: where was the cake? All I could see was a big mass of candied fruits and nuts barely needing cake batter. I made it my mission to make the one I used to have at home. I made three that first time, one for roomie and me, one for the two guys downstairs and one for Isabel. It took a little convincing but they tried it and loved it! When B. and I spent our first Christmas together, I then used womanly persuasion and he agreed to try it, he liked it so much that now he calls me from the grocery store as soon as he sees candied fruit on the shelf. I have already made 3 this week and the neighbors want more. 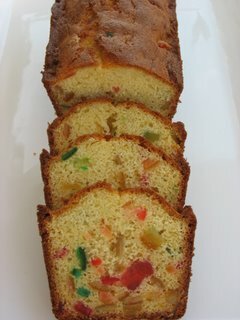 Even if you think you don't like fruit cake, I think it is worth a try. My sister in law can't stand it so we make it with almonds instead, I guess the batter is really good on it own. I believe my mother got the recipe from a magazine many moons ago claiming that it came from the Lenotre Patisserie. I cannot validate this statement but I would not be surprised if it did as all their confections and desserts are scrumptious. bake in a 350 degree oven for 20 to 30 minutes. The top will get brown quick so make sure the cake is dry in the middle (insert knife) before you remove it from the oven. Faire tremper les fruits avec le rum pendant la preparation du cake. Reduire le beurre en pommade avec le sucre glace. Incorporer les oeufs un a un, en melangeant bien apres chaque addition. Ajouter la farine et la levure. Egoutter les fruits confits, les ajouter a la preparation avec 2 cs. du rum. Mettre dans un moule a cake et faire cuire a 180 C pendant 20 a 30 minutes. I like fruit cake. But I really love Tipsy cake...it is put out by Jack Daniels....Whoa, tipsy is right. I love Lenotre, especially the chocolate. 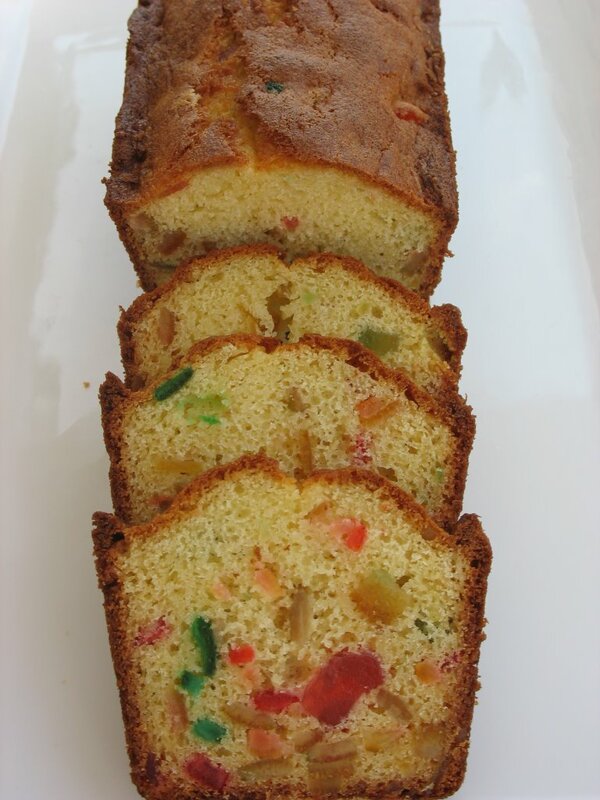 I'm not a huge fan of fruitcake in general, but I love the one my Grandma makes that's full of cream cheese. ooh..they look good. i like this kind of fruitcake where they're not as dense as the commercial ones. Peabody: now I need that Tipsy cake recipe...Jack Daniels is one of my uncles' favorites. I love Lenotre chocolate too. I plan on bringing a lot back when I get home soon. Brilynn: you know what's coming don't you? Post that recipe please! Eliza: I think I'm gonna have to make one for the mailman...he read my blog! C'est le dessert par excellente de mon enfance, ma maman en préparait lorsque nous partions au ski les week-ends d'hiver !!!! Truffle, How Do I love Thee?